Happy Cinco de Mayo!! When the weather gets caliente… the salads come out! Nothing makes me feel more refreshed than a crunchy, cool salad on a warm day. Today I made a salad with low-fat tuna, delish cherry tomatoes, corn, cucumbers, on a bed of spinach. Spinach is great for salads because it has a lot of iron, and I find it to be less bloating than some other lettuce choices. One of my latest obsessions is the low-fat tuna salad sold at Whole Foods. I eat this at least once a week, because it is super easy lunch on the go and also delish! They throw red peppers, dill, cornichons (fancy name for mini pickles), and albacore tuna together. It has just the right amount of flavor and no mayo! Most prepared tuna salads that you find in deli stands have tons of mayo added, which can be incredibly fattening, and not such a healthy choice. 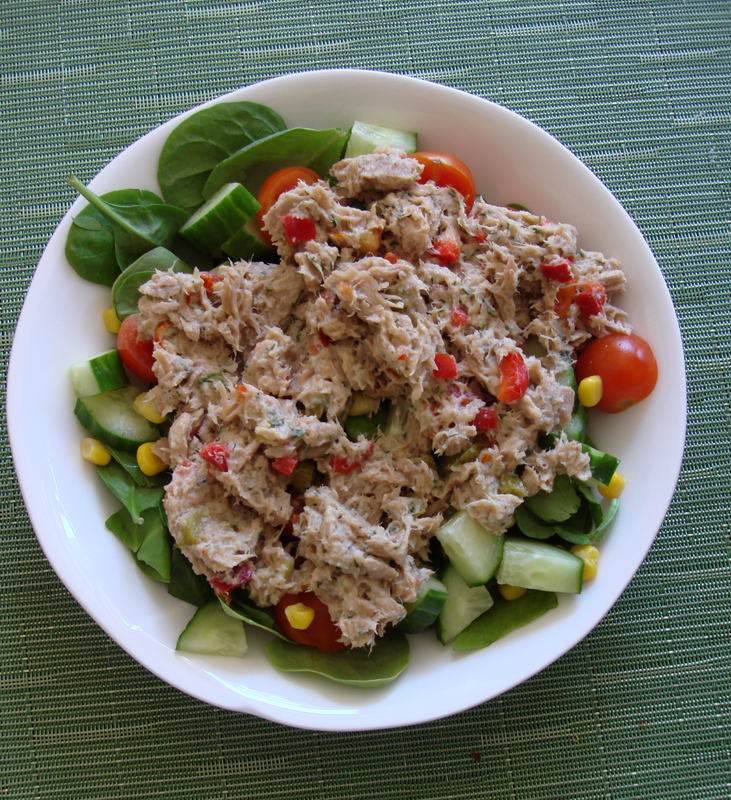 Your average tuna salad has almost 400 calories for one cup, and 19 grams of fat. Read: prepared tuna salad = muffin top. A healthier choice at the deli counter is getting plain albacore tuna (no mayo added) on whole wheat bread or on top of lettuce. You can always add low fat mayo if you miss it, or a low fat vinaigrette also adds a punch of flavor.